Ephemera Society of Australia Inc.
NOT TRAVEL EPHEMERA, BUT RATHER SPENDING ON TALKING ABOUT EPHEMERA. If you could book a flight to a hub of ephemeral activity, where would you go? What about Old Greenwich, Connecticut on 14-17 March? That is when the Ephemera Society of America will be holding its annual conference on the theme ‘Coming to America – the immigrant experience’. Coming from Australia we have plenty of comparisons to make with the US collectors about immigrants – perceptions, prejudices, treatment. 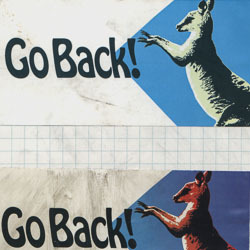 In Australia our immigration ephemera can span the inclusive, the benign to hostile. We have literature luring the ten- pound Poms or the current tertiary students, how-to-assimilate booklets, posters, badges, flyers, street-pole stickers. Is this anti-immigration or anti the anti-immigration? From the collection of Australian ephemera of member AB. ‘Embracing Immigration: posters, advertising and the outsider’ by Angelina Lippert who is the Chief Curator of Poster House, America’s first museum dedicated to the art, history, and impact of posters. Lippert has found a positive message in World War I posters printed in multiple languages, speaking to immigrants about how they were welcomed to the U.S.A. and how, in return, they could express their loyalty through the purchase of war bonds and other ways of aiding the war effort. By World War II, those sentiments were still there, with second-generation Americans being referred to as “Ellis Island Americans,” an essential and patriotic part of the fabric of the country. ‘What’s up, Sam Wah? Whitewashing Chinese Laundrymen’ by Professor Sheng-mei Ma, Ph.D. From 1886-1943, when the Chinese Exclusion Act (USA) was in force, Chinese laundrymen managed to eke out a living wherever menial labour was required away from coastal and metropolitan Chinatowns. These laundrymen — “perennial aliens” — still appear in racial stereotypes on contemporary ephemera, and can be traced from the 19th century to the present through comics, newspaper editorial cartoons, and even Lon Chaney’s yellow-faced laundryman in Shadows (1922). ‘What Irishmen have done’ by Sarah Weatherwax. Weatherwax notes that over 200,000 Irish immigrated to America in the mid-19th century. They faced fierce ethnic and religious discrimination. Ephemera perpetuated demeaning stereotypes in: comic valentines, song sheets, trade cards mocking the Irish accent, their appearance, and drinking habits. But the sheer number of Irish created a consumer market for more positive portrayals. The Civil War generated ephemera designed to appeal to Irish pride about their contribution to the war effort.